One key capacity of organisations capable of transformation is the ability to adopt new ways of working. That might seem obvious, but why is it so? Because Amazon Prime Now was developed from a concept, to a ready for launch service in 111 days (1). Because Elon Musk transformed a customer complaint on Twitter into a real Tesla feature in under a week (2). And because old ways of addressing opportunities simply don’t work anymore (1). During the past 15 years, 52% of Fortune 500 companies have disappeared and their life expectancy has shrunk from 75 years in 1995, to merely 15 in 2016(1). Creating buzz around innovation is no longer the name of the game. In fact, the game itself has fundamentally changed. It's a hunger game out there. And in here. The month of packed gyms, diet food and lax promises is looming. The first month of the year sees a nation commit to getting into shape by finding an alternative diet, as many opt for extreme regimens based around pineapples and lemons. We push through with it, tasting tenacity for 31 days as we know that once February arrives, so will pizza. January was just temporary, leaving us with short-term fulfilment. The relapse is real. During the first two months of the year you obediently eat your lemons, participate in workshops and interviews because your boss is a new age hippie and consultants just won’t leave you alone. This year it’s a customer insight project, next it’s a hackathon. But as with any fitness program, when the lights go down and nobody is around, you’re back in bed with a margherita. It happens to the best of us. It happens to companies wishing to change without having to change. Any personal trainer will tell you that if you want to avoid the yo-yo effect, a lifestyle change is your only option. Eat different, prioritise different, live different. But we all know how difficult it is. It’s just so much easier to buy bigger jeans. Everyone that’s “done” it says it feels amazing, like being a different person, all of a sudden blessed with energy and positive vibes. Luckily many companies are really pushing themselves in the direction of change. At SDGC18, companies like OP(3) and Adidas(4) discussed their lifestyle changes, with OP structuring its through the Danish Design Center’s design ladder. 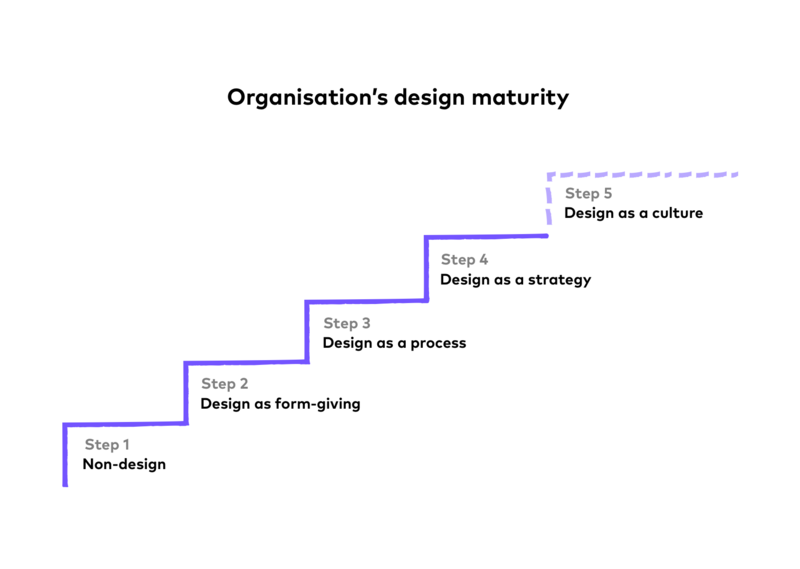 Taking all the necessary steps up to “Design as a strategy” took them about 8 years (excluding the non-design phase), and it will take longer to get the whole company to that level. To keep evolving and moving up the ladder, OP has set its sights on “Design as a culture,” where inquiry becomes a common approach in the company. 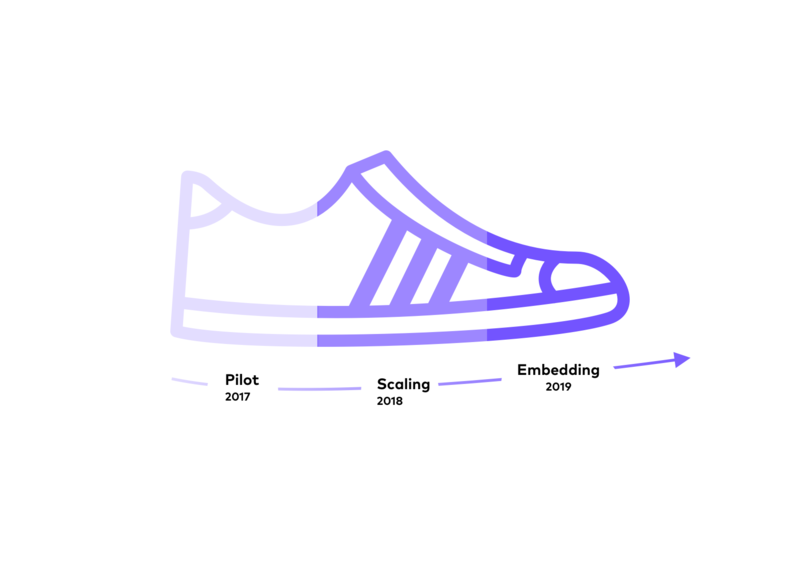 Adidas see themselves on a path that started with piloting in 2017, scaling in 2018 and is now moving towards embedding new ways in 2019, which they refer to as “the shift to agile & CX.” During their journey Adidas has had to balance ambitions of the future with everyday realities of a big organisation; figuring out how to scale but also simultaneously tailor methods to meet a multitude of scenarios; and ultimately an appetite for moving along swiftly, while still accepting that change happens gradually. Cork County Council had gone through a major organisational change of their own. The council’s starting point was quite an uncomfortable one, as its employees falsely thought they’re work was seen in a bad light by the public. What you measure is what you get, right? And as muscles weigh more than fat, beware of your metrics when doing so. The end goal of transformation is a well performing company. But in the early stages of transformation it will be difficult to make the connection from an activity, say capability building, to your net sales. These metrics should be applied with caution so that you don’t end up killing transformation activities before they even start to take shape. It’s better to have more qualitative aims early on, while using learning itself as a metric. This can be done for example by having different activities as goals, such as conducting 10 customer interviews. It’s most important to track the learning curve and apply that knowledge to the actions you take thereafter. These metrics are often used in the mid-levels of the ladder. For example, keeping score of your designer-to-developer ratio is a simple way to keep track of your in-house skills. IBM have gone from having one designer per 72 developers in 2010-2012, to one designer per eight developers in 2017 (6). You can also measure how certain skillsets are represented in different types of projects. A commonly used metric seems to be measuring the time it takes for an idea to be launched, which is a good way to emphasise the importance of presenting ideas fast and early on, but simultaneously as a metric it might favour easy ideas over impactful ones. Cultural transformation requires cultural metrics. Adidas mentions notions like “team happiness,” “individual motivation” and “collaboration with others.” OP adds organisational learning and sees these metrics moving from external to internal ones, as transformation evolves to its later stages. Being a company capable of transformation means making wholesale changes that impact work-lifestyles, which require years of consistency and commitment, as well as the coming together of good leadership and flexible minds. Creating safe and trusting environments for people to learn and fail, providing tools, building new teams and evolving the capabilities of the organisation are all attributes of such an organisation. What’s at stake is not one -ism, but finding a mix of many that suit your genes and body type.